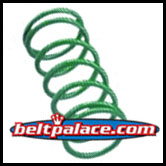 Comet 203039A - Green Compression Spring for 40/44 Series Comet Industries Drive Clutch. Home > Comet Clutches and Parts > Comet 203039A - Green Compression Spring for 40/44 Series Comet Industries Drive Clutch. 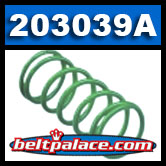 Comet 203039A - Green Compression Spring for 40/44 Series Comet Industries Drive Clutch. Comet Industries 203039-A. Comet 40/44 Drive Clutch Spring 203039-A. Genuine Comet 203039A Compression Spring (Green) for Stock Engagement of 1600 RPM (40 Series) with Comet Industries Yellow Spring Kit 203043A. For use with Comet 40C/44C Series Centrifugal Clutch drive systems. Made in USA by Comet Industries.